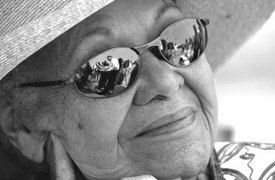 Katherine Dunham, a pioneering dancer and choreographer, author and civil rights activist who founded America’s first major Black modern dance company, died May 21. She was 96. Dunham was perhaps best known for bringing African and Caribbean influences to the European-dominated dance world. An indomitable cultural figure that Dance Magazine once called a “one woman revolution,” Dunham fought barriers and prejudices to integrate the rhythms she learned in Haiti, Brazil and Cuba into American formal dance. Dunham was born in Glen Ellyn, Ill., on June 22, 1909, the daughter of an African American dry cleaner and a French Canadian mother. At the University of Chicago, she became a promising anthropology student, winning a fellowship to study anthropology in the Caribbean. But she always loved dance. At 21, she founded the Ballet Negre, her first company, in Chicago. Dunham married costume designer John Pratt in 1941 and they adopted an orphan, Marie-Christine, from Martinique. John Pratt died in 1986. Her dance company toured internationally from the 1940s to the 1960s, visiting 57 nations on six continents. Her success was won in the face of widespread discrimination, a struggle Dunham championed by refusing to perform at segregated theaters. In Cuba, Dunham was honored by the socialist nation with its Fernando Ortiz International Award for her lifetime contributions to dance and choreography and her promotion and celebration of African and African American culture. In 1951, she moved audiences with “Southland,” a dance about a Southern lynching that Dunham believes hurt her efforts to obtain U.S. sponsorship for her overseas travels. After 1967, Dunham lived most of each year in East St. Louis, Ill., where she struggled to bring the arts to the Mississippi River city of burned-out buildings and high poverty rates. Dunham kept up her activism and made international news in 1992 when she undertook a 47-day hunger strike to protest the U.S. policy of turning back Haitian refugees to their military-ruled island.